Made using premium quality aluminium, the Workstation Aluminum Frame offered by us is manufactured at our high-end production unit. These frames are used to create a border on the edges of the office workstations so that they do not get damaged or broken. These aluminium frames are highly durable and rust-resistant, because of which they also lend a flawless and neat finish to the workstation frames. 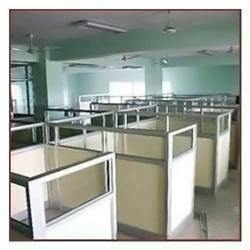 Established in 2013, we, Sourabh Aluminium Company, are counted among the prominent service provider of highly qualitative Aluminium Door and Grills. These are manufactured at our modern infrastructure area using purity-certified aluminium as the main raw material. These products are available to clients in a vast range and are available in multiple specifications of shape, size and design. Our aluminium products are known for being durable, sturdy and damage-resistant. These are easy to install and have negligible needs for maintenance. The demand for these products is high in residential, commercial and industrial areas. We make these products available to clients within their specified time and budget constraints. Easy to install and maintain, these aluminium fittings are also acclaimed for being highly suitable for rugged use. The quality of these products is certified prior to dispatch. We also offer Structural Glazing and ACP Panel Sheets Work Services also. Note :-We Deal In Delhi Local Area Only.